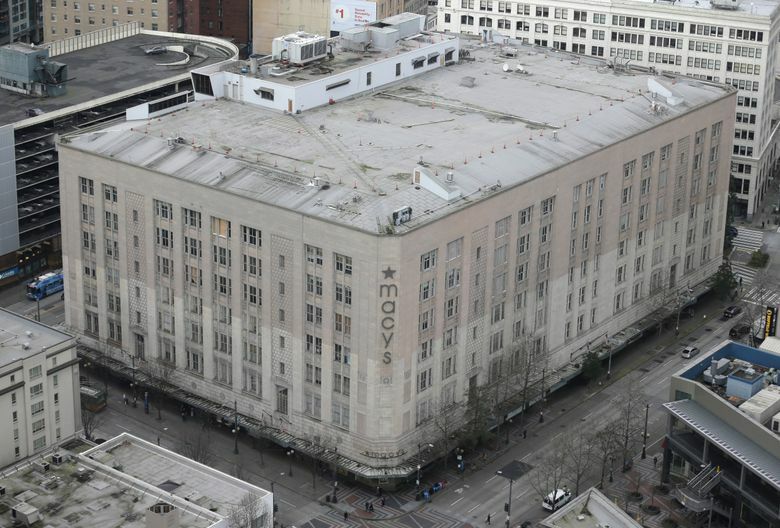 In the latest irony of the Amazon age, the Seattle company is taking over the top six floors of the Macy’s building in downtown, giving the online retailer a good chunk of space formerly occupied by a brick-and-mortar icon. The lease, confirmed by an Amazon spokesman, is the latest sign of expansion in the company’s hometown, even as Amazon seeks to build a second headquarters campus somewhere in North America. Amazon’s space in the Macy’s building at 300 Pine St. — 312,000 square feet — is enough to hold about 1,500 employees. They’ll be working above the Macy’s store on the ground level and basement. By itself, it represents one of the biggest leases of Class A office space in the city — only a few companies, like F5 and Zillow — have more total office space in Seattle than Amazon will have just at the Macy’s building. News of the lease comes a few weeks after Amazon confirmed it would take the entire office-space portion of the planned Rainier Square downtown skyscraper, a massive 722,000-square-foot lease. Until recently, Amazon had occupied about three dozen offices in South Lake Union and the Denny Triangle. But the move south into the downtown core indicates the company may be running out of room in the South Lake Union area it now dominates. Amazon has now leased 1.65 million square feet in Seattle across five buildings so far this year, according to the Broderick Group. The company has nabbed five of the seven biggest office leases in the city this year. The two other big leases? The Broderick Group reported this week that Oracle, a tech company based in Silicon Valley, is opening a 160,000-square-foot outpost downtown in the Russell Investments Center. And F5 took an entire downtown skyscraper earlier this year. 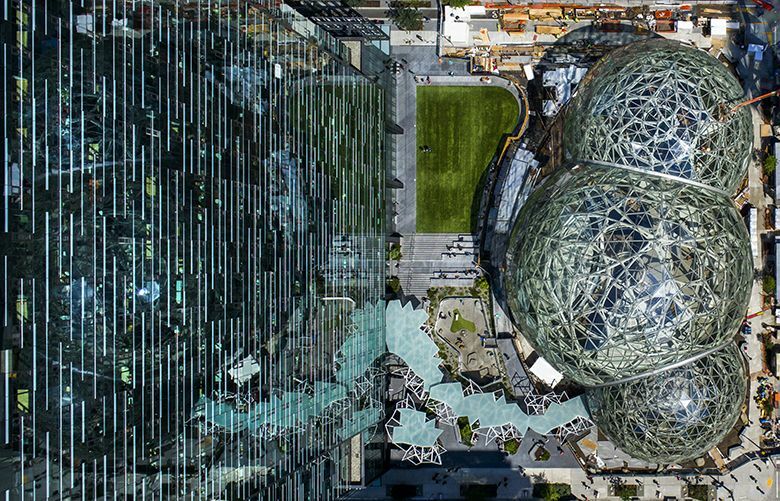 Amazon occupies more than 8 million square feet in the city, up from 4 million square feet just 2½ years ago. No other company in any major U.S. city has that much space. Connecticut-based Starwood Capital Group, which will be Amazon’s landlord at 300 Pine, declined to comment. Starwood bought four floors in the eight-story building for $65 million in 2015 and added the other two floors this year. The building has been a historic city landmark since 1988. It used to be the Bon Marché Department Store — at one time the only whole-block development in the city.